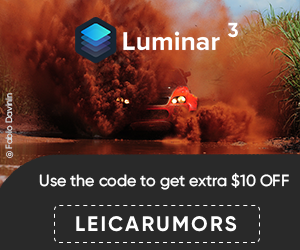 "The 24x36mm full frame CCD sensor utilized in the Leica M Series rangefinder cameras produce significantly poorer raw image quality, compared to results from DSLRs featuring a CMOS alternative. 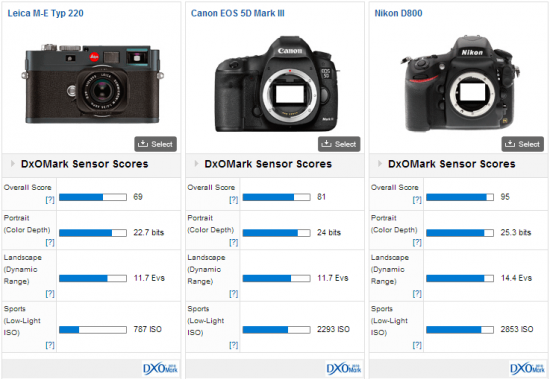 In fact, with a DxOMark Overall Score of 68, or 69 for the Leica M9, M9-P and ME Type 220, these cameras offer the worst image quality DxOMark have tested on a full frame sensor, with the exception of the 10-year-old Canon EOS 1Ds. No doubt Leica enthusiasts will assert we’re comparing apples and pears, and the advantages the Leica M System offers in terms of simple control, portability and discretion, as well as first class engineering, are more important. It’s fair to say too these results purely examine the data from the sensor, excluding the impact top quality Leica M Mount glass will have on the real world results. 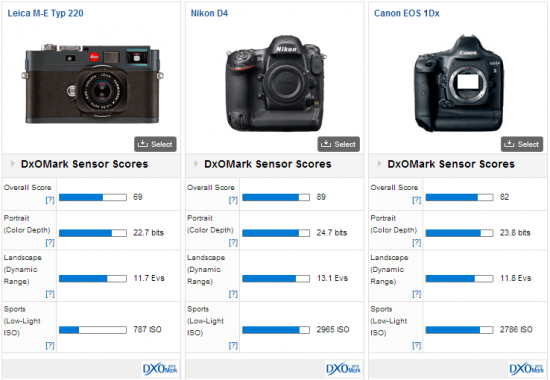 At base ISO sensitivities Dynamic Range and Color Depth scores aren’t quite as far away from competition, like the Canon EOS 1Dx and 5D MKIII, as the DxOMark Overall Scores might suggest."